For cattle producers, half the battle to keep cattle healthy is choosing the right vaccine to help prevent bovine respiratory disease (BRD) says Jon Seeger, DVM, Pfizer Animal Health, Cattle and Equine Technical Services. BRD is the leading cause of economic loss in the beef industry, with losses of up to $240 per head. Cattle that never develop BRD are more productive and less costly than those treated for the disease. For that reason, it pays to help prevent the most frequent causes of BRD with a complete vaccination program. There are many causes and complexities of BRD, but viral infections and stress typically are involved. Minimizing stress and the use of a vaccine that helps prevent common bovine respiratory pathogens, such as infectious bovine rhinotracheitis (IBR) virus, bovine viral diarrhea (BVD) Types 1 and 2 viruses, bovine respiratory syncytial virus (BRSV) and parainfluenza 3 (PI3) virus, are key to helping prevent BRD and its associated production losses and treatment costs. For a sound respiratory vaccination program, choosing a suitable vaccine requires careful planning with a veterinarian, and consideration of the following steps. 1. Evaluate specific operation needs: Every operation is unique. When selecting a respiratory vaccine, producers should work with their veterinarian to assess the herd’s needs based on disease challenges and geographic location, as well as the producer’s individual management system and production goals. Producers can then align the right vaccine with the operational needs of their herd. 2. Know what types of vaccines are available: Vaccines may be either modified-live or killed. Modified-live viral (MLV) vaccines contain live organisms that can undergo limited replication within the body. Most MLV vaccines are often effective with a single dose and can have many benefits, including a quick immune response, demonstrated duration of immunity (DOI) and fewer post-vaccination reactions. When choosing between vaccine types, a veterinarian familiar with the operation, type of cattle and disease problems in the area can offer the most qualified recommendation. 3. Understand vaccine label claims: Not all vaccines are created equal. Even vaccines of the same type can provide different levels of protection. Producers should read labels closely to best understand how products relate to the needs of their operation. Label claims are granted to indicate a product’s expected level of protection against a respective pathogen. Also, if a vaccine has a demonstrated duration of immunity claim, it will be clearly stated on the label. Duration of immunity claims indicate the demonstrated minimum amount of time the vaccine will provide the labeled level of protection. 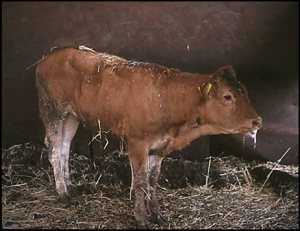 In general, producers should look for a vaccine that offers a duration of immunity that covers the desired phase of production. If the vaccine label claims meet the needs of their operation, based on the pathogens, levels of protection needed, as well as the demonstrated duration of immunity, producers can rest assured their cattle are best equipped to combat BRD. Using the appropriate respiratory vaccine as part of a comprehensive herd health management program can help ensure the health and productivity of a herd. Teaming up with a veterinarian to develop a complete respiratory vaccination program can help producers manage disease challenges in their herd and prepare their cattle to win the fight against BRD.